Pura Goa Lawah (Bat Cave) Temple is one of the historical and protected temples of the State, which has now become a very attractive tourist attraction. Located in Klungkung Bali, Goa Lawah Temple is a sacred and beautiful area. The scenery in this temple is very distinctive. As the name suggests, in this temple there are caves that are under shady trees and inside the walls of my mouth there are many dependent bats. Crowded bat sounds endless, morning, noon especially night. Instant tens, hundreds or even thousands of tails flying. Soon to come, hanging, hanging, jostling on the coral walls of the cave. This is unique in Goa Lawah Temple. Goa Lawah Temple has its own charm, especially with its enchanting natural scenery, a cave that is under shady trees. In front and at the mouth of the cave there are several places of worship that are commonly used as a place of worship in Hindu rituals. 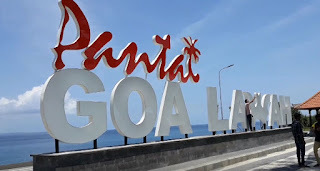 This Balinese temple is on the opposite side of the beach and enters the hilly area, where there is a combination of sea and mountain (lingga-yoni). A temple was also built on this beach called Pura Segara. Pura Segara is a temple of the surrounding community, most of whose livelihoods are fishermen to worship God as Bhatara Baruna or the God of the Sea. Because of its location near the beach, Goa Pura Temple is visited by many tourists. Entering the Pesinggahan Village area, tourists will find many food stalls with special menus of sea fish. Along the road to the location of Goa Lawah there are many food stalls offering pepes, grilled fish, fish satay, fish soup, etc. There are also many stalls to enjoy seafood dishes around the temple location. Besides that, in Goa Lawah Temple there is a fairly large parking area available, so if tourists bring their own vehicles do not need to be confused to find parking locations because parking can choose to park around the temple or on the beach.